Recently, the Confederation of Indian Industry released a report indicating that women comprise only 16 percent of junior managers, four percent of middle and senior managers and a mere one percent of organizational leaders. Thus, while women are adequately represented in the Indian workforce at large, they remain barely present in managerial positions. This is inspite of ‘diversity in workforce’ being the buzz word of a number of corporates in the recent past. It is a popularly held misconception that a flexible and supportive work environment is enough to keep a woman employee engaged and loyal. While there is no denying that flexibility is critical to help her hang on to a job, to keep her engaged and drive performance would require much more. Unravelling leadership – the lighter way! The Battle of 2014: The Story of HOPE! What explains the unprecedented results of Indian election May 2014? One important thread which ran across multiple sections, religions and faiths of people is the rise of ‘HOPE’. People of world’s largest democracy were united by the feeling of ‘collective desperation’ which permeated the rule of earlier government. Hence, when an aggressive, confident and highly expressive leader approached them with a promise of ‘good days ahead’, people once again could ‘HOPE’. 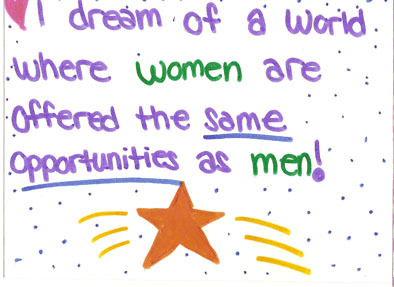 They could again hope for fulfilling their aspirations and realizing their dreams. The power of HOPE has been narrated in many anecdotes and struggles. Whenever despondency had eclipsed the mankind, hope emerged as powerful weapon to fight against all odds and establish a new rule. One such story goes like this…. When the king of Scotland, Robert the Bruce was defeated by the king of England six times in a row, Robert and his army were driven into flight and scattered in the woods. Robert hid in a cave, tired, sick at heart and ready to give up all hope. Then he noticed a spider over his head trying to weave a web. The spider failed many times but finally after many attempts, he was successful. The king was fascinated and decided to try one more time. He gathered his men and they fought with bravery to get their kingdom back. To this very day, victory and independence of Scotland is attributed to the spider which inspired the king. Hope has also been played upon by various institutions like corporates, religious institutions, influential leaders etc. to push forward their idea, product or opinion. What works almost like a magic is the ability of the leader to connect with the pulse of the people and help them show the vision of what they want. When people are able to think, feel, see and hear about what they want, the mind gradually starts believing into the idea, thought. Some examples of such leaders are Mahatma Gandhi and Martin Luther King who were able to create a vision of change and mobilize millions of people towards it. There are also many examples of failures that were led by misplaced faith based on wrong assumptions and fallacious grounds. Such examples include the rise and fall of Hitler who also connected with the aspirations of people but based it on retribution, resentment and hatred. This has some important implications on the leaders to understand human mind. Anyone in the role of influencing others needs to be able to engage all mental faculties of their audience to be able to arouse emotions and feelings and give them ‘HOPE’ about desired possibilities. For the hope to survive in the long run, it is must that the leader devotes himself to the needs and aspirations of the people. This would definitely help bring about ‘good days ahead’ for a nation ready to take on the path of progress. Will a leader like Modi work for a democracy like India? The task of the leader is to get his people from where they are to where they ought to be. The stage at which India as a nation is poised, the question of ‘where we ought to be’ is a moot one. Irrespective of the current state of affairs w.r.t literacy, health and sanitation and globalization, India continues to be one of the most high-potential economies of the world. However, for all its potential, it is also a nation of multiple complexities – with multiple ethnic groups, a challenging set of neighbours, a legacy of not-so-wise economic policies and so on. At this very critical juncture in its life-cycle as a nation , India was poised with a very important question about a month back – what kind of leadership is needed to guide this nation to ‘where it ought to be’. The nation very decisively chose a leader widely perceived as ‘authoritarian’. Is it a good decision? Only time will tell.. but there is merit in evaluating why the electorate thought as it did. As per Lewin’s definition of ‘authoritarian leadership’, such a leader is one who believes in taking all the important decisions himself. It is the leader who decides how the work has to be done and by whom. The subordinates simply carry on with the work assigned to them. They are not allowed to give any input regarding how they should do their work or conduct daily activities. Every detail is pre-decided by the leader himself. 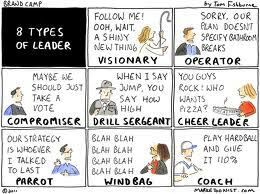 This kind of leadership usually works well if the leader is competent and knowledgeable enough to decide about each and everything. 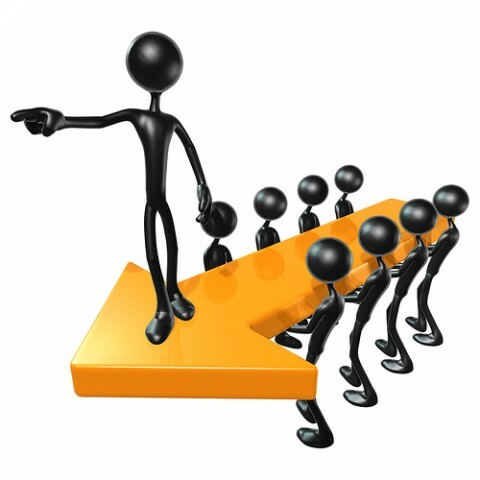 Authoritarian (or autocratic) is considered one of the most effective leadership styles in case there is some emergency and quick decisions need to be taken. Such examples can be found in the real world in people like Bill Gates and John F. Kennedy. And more closely in the Indian political system, was Indira Gandhi. Lewin also found that it is more difficult to move from an authoritarian style to a democratic style than vice versa. Abuse of this style is usually viewed as controlling, bossy, and dictatorial. The Hay Group, however, too has studied leadership styles in detail and has come up with an alternative view of leadership where there is a clear segregation between a ‘coercive’ style and a ‘authoritative’ style. The difference lies not merely in the semantics but also in the entire approach that the leader takes. While a coercive leader tells the staff what is to be done and expects them to toe the line without any questions (much the same as an Lewin’s authoritarian leader), the authoritative leader is focused on communicating the long term vision and purpose and ensuring that everyone is aligned to and motivated by ‘the big picture’. He wins people over by convincing them that they want to do the job. He gives feedback to people about where they are vis-à-vis their goals and creates a positive climate. People under him too toe the line, but willingly and enthusiastically because they know what they need to do, why they need to do it and why their role is important. It is early days to comment on Modi’s leadership style. A look at his past record presents a hazy picture. While by some he is viewed as a ‘change agent’ who made the right decisions and pushed them assertively through layers of inefficiency in Gujarat to create prosperity, by others he is viewed as dictatorial and self-centered in his leadership style. At the juncture that India is (emerging from the shadow of a lax government which made no decisive actions), what India needs for sure is a leader who is not afraid of making tough decisions and is ready to embrace the responsibility and accountability of taking his decisions to conclusion. The biggest responsibility of leaders is to create more leaders in the organization. A leader’s ability to develop his team members through appropriate methods helps the organization create a stable pipeline of leadership and an enviable talent pool. The most effective leaders identify and nurture their team’s potential, bring out the best in them and prepare and propel them for optimum performance. The most critical aspect of leading a team is the team leader’s ability to help his team members get trained on the job and quickly move up the learning curve. He has to alternatively wear hats of being a trainer of core tasks & skills, facilitator of learnings, teacher, advisor, counselor, coach etc. The nature of intervention chosen will vary from one team member to the other depending on their level of skill and will. 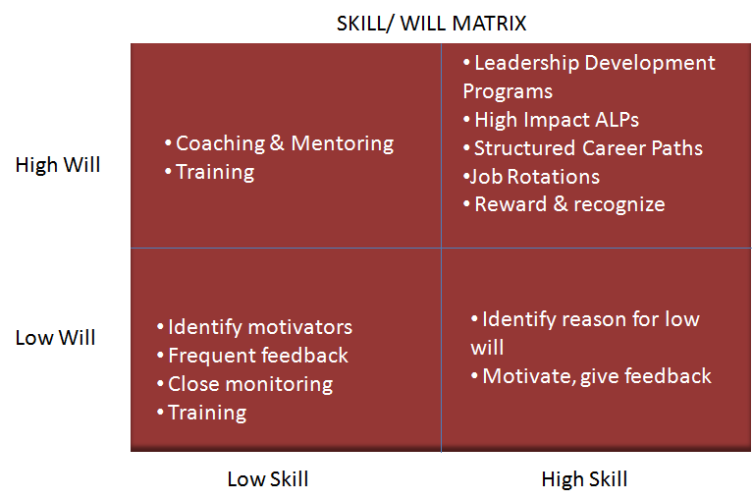 The skill-will matrix mentioned below gives an indication of how the intervention methods should be chosen for bringing out the best in people. Acting as a trainer, the team leader needs to understand the team’s skill gaps and their learning styles. Low skill issues can be solved by on the job/ classroom training programs. ADDIE framework of Intervention Design and facilitation skills help to create an impactful and business oriented training plan. The performance management process offers a potent tool to manage individual and team performance to ensure that key goals are consistently being met in an effective manner. A holistic performance management process includes setting goals, measure performance against identified targets, providing objective feedback at regular intervals and creating development plans. A well structured framework (STAR – Situation Task Action Result) helps the leaders provide specific, behavior oriented feedback and avoids personal biases and subjectivity. Employee with low skills/ low will need more time and more frequent feedbacks to help them move up the learning curve. Low will issues usually are greater challenge for leader than skill issues as it requires taking a deep dive into an employee’s psychological and motivational state. Choice of appropriate psychometric tool can provide invaluable insights which can be used to identify future course of action. One of the most powerful interventions to support employee growth and development is the use of Coaching and Mentoring. It can be used to develop the team member’s skills and abilities, boosting their morale and improving performance. While coaching is more focused on helping achieve a specific objective within a specific period of time, mentoring is more long term growth and relationship oriented. It helps by providing employees a sounding board within the organization. • Discover – the talent, strengths & development areas of each team member. • Develop – their potential, leverage their strengths and help them work around improvement areas through structured learning and development programs, coaching, mentoring and providing right exposure. 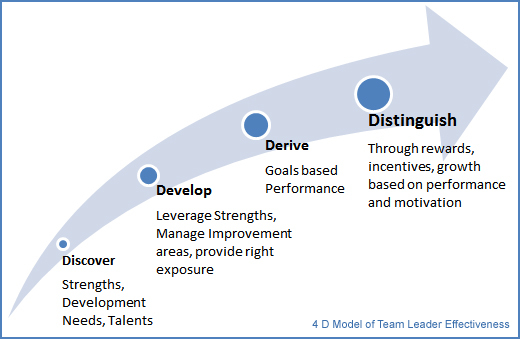 • Derive – maximum performance out of each team member focused around team goals and targets. • Distinguish – between team members basis performance, not everyone can or will perform at same level. Use different reward tactics. Understand and capitalize on different motivational levers.